Join stained glass artisan, Joe Beyer of Beyer Studio, Philadelphia, PA for a discussion on the history, iconography and spirituality of American stained glass on Wednesday, March 20th at 7 PM in the gymatorium. Beyer Studio will be removing the stained glass windows from St. Francis Church in Philadelphia for us and installing them in our new windows. Listening to him describe our present windows was amazing. We can anticipate an enlightening evening. Here is a preliminary design of the Main altar for Holy Cross Church. The pattern is inlaid marble front and back, while the mensa (or top of the altar) is the white colored marble. How exciting to see the first renderings of the altar. This altar will be a freestanding altar in the middle of the sanctuary. The Altar of Reservation will be affixed to the wall and support the tabernacle and reredos. The Main altar is available for a memorial donation. Please call the Parish Office for more information. Thanks to the help of parish staff and volunteers, the Stations of the Cross and our Church statues were packed safely away and were carried to the rectory basement for safe keeping. The Stations were easily removed from their very substantial hooks on the wall, carefully wrapped in bubble wrap, enclosed in a plastic bag, labelled and transported individually to the safety of the rectory basement. Mary, St. Thomas and St. Anthony also made the trip. Joe Beyer of Beyer Studio in Philadelphia visited Holy Cross today to inspect our church windows in preparation for their removal and the cleaning and reinstallation of the St. Helena, St. Alphonsus and St. Anthony windows. It was a pleasure to listen to his expert opinion about the glass and listen to him "read" the story told by the original glass and its repair(s). Our original windows date from around the very beginning of stained glass in America. The most valuable windows seem to be in very good condition, especially given their age. Joe described the process by which the glass in the side windows was made using rolled glass stenciled with patterns in silver nitrate, then kiln fired. Interestingly the repairs to the glass, which he showed us how to spot, had to be painted by hand. Though I could have listened to him for hours, I left him alone to inspect and measure our windows so that he can develop a timetable for their safe removal, inspection and cleaning. Joe suggested that the glass from the side windows can be cut into sizes useful for the home and auctioned or sold as fund raisers for the project. Several parishes have met with great success in these sales. 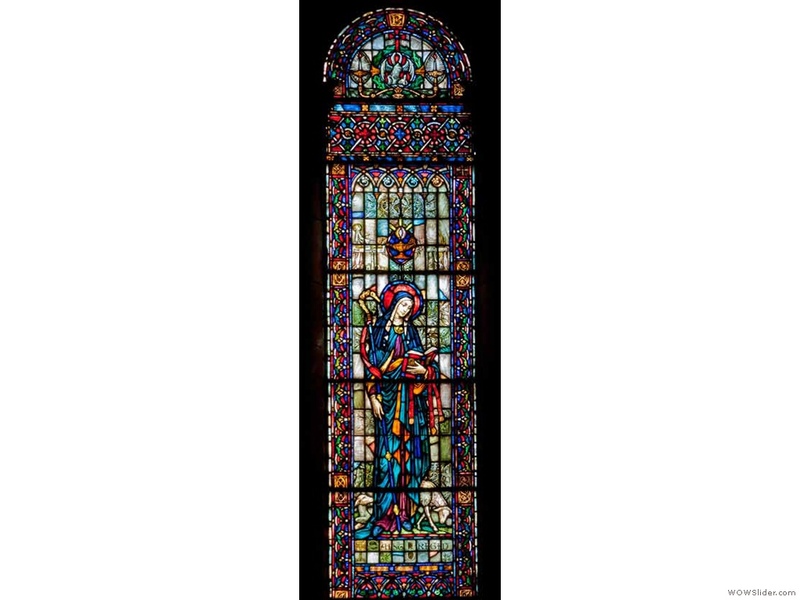 Meantime, the Archdiocese of Philadelphia has given the go ahead for the removal of the stained glass from St. Francis Church to our possession. Who could anticipate that I would hear the news of Pope Benedict XVI resignation in ring right before I was to begin judging at this year's Westminster Kennel Club? Despite the fact that he had written about the possibility more than once, somehow it hadn't seemed immiment although I had not been following most recent papal photos or watching videos of his public appearances. Weighty public office, including the Petrine ministry exacts a toll on those who hold it and photographers often note the appearance of gray hair and wrinkles or "worry lines" on presidents and popes alike. In my view, the pope's resignation is just one of many courageous and prayerful actions he has taken for the good of the church and mirrors his prayerful and courageous acceptance of the ministry eight years ago. Inevitably we are now being treated to insta-nalysis of his entire pontificate, of his place in history, of his effectiveness as a spiritual and temporal leader just as if he has already died. One of his most enduring gifts to the church will surely be the Latin Mass. Only this morning the parish staff and I were discussing the challenges in equipping our small chapel for worship during the renovation of the much larger church. Latin mass last evening was packed with parishioners and non-parishioners of all ages, including several families with small children. The fruits of this gift to the church will only be apparent many years from now - the ecclesiatical pundits should be prudent in their sweeping assessments of this deeply spiritual man's influence on the church. We had a few intrepid pilgrims for 9 AM mass this morning who reported county roads were passable and others not so. The parking lot has some snow, but a more dangerous layer of thick ice underneath. Our hard-working maintenance crew has been plowing, sanding and shoveling all morning. If you parked your car on the church parking lot because of danger of flooding last night, please come and remove them as soon as possible. The request from Rumson to the church was for overnight parking only - vehicles in the parking lot impede our efforts to plow, sand and salt the lot for school and worship. 5 PM mass is scheduled in the gymatorium as usual. Please click the Album link to the right for detailed photos. Monstrance for the renovated Sanctuary. This will be on display at all the weekend masses along with other liturgical items Holy Cross Church has acquired with funds generously donated to the "A Time To Build" Campaign. Tomorrow a few members of the parish staff will travel to Philadelphia to pick up several items from the Archdiocese of Philadelphia for our renovated church: a beautiful cruciform-shaped monstrance, and an entire set of altar candles and altar cross for the Altar of Sacrifice and Altar of Reposition in the new sanctuary. 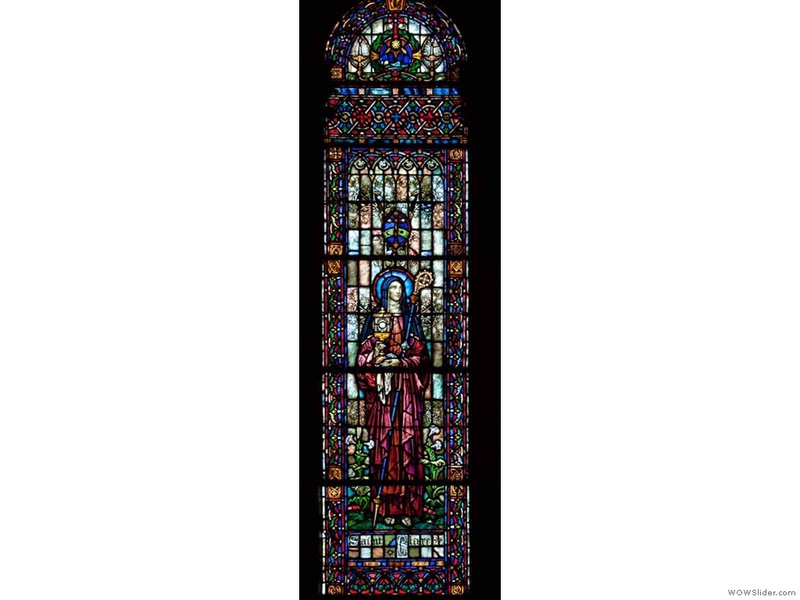 At that time we hope to finalize the proposal for the acquisition of the stained glass windows from the former St. Francis Church in Germantown, Philadelphia. We will post photos of the new items as soon as we have them and place them on display during the weekend masses. The monstrance has already been memorialized, but the other items available will be listed this weekend. Today our meeting with architects, contruction manager and parish staff went very well and much was accomplished as our project budget heads into its final phase. The permit application will begin, work-site plans will be drawn up and the subcontractor contracts will be opened for competitive bidding. Performance bonds have been signed and the contract with the construction manager reviewed, commented upon and readied for the final revisions and the bishop's and pastor's signatures. All signs point to an official groundbreaking at the beginning of April, probably after Easter vacation. work, but carry a lot of weight as well - 170 diagrams, over 15 pounds. In preparation for tomorrow's meeting with architects, construction manager and parish staff, Fr. Manning unrolls the full-sized set of plans. As you may know, we have decided to retain the "short" pews for use in our chapel along with their kneelers. This will enable us to kneel for the Latin mass and daily mass. Accordingly, there are a few less pews than anticipated for donation. Beginning today, the pews may be removed from the church. We will have to prioritize our list using criteria such as date requested, number requested, etc. Remember, if you would like a pew act now, we cannot promise the shorter pews will be available even when construction is complete. PS Amazingly enough, an entire full sized pew can be easily removed with a pair of pliers by unscrewing two small bolts! We are gradually outfitting the Holy Cross chapel to best suit our needs and in coordination with the activity in the church. Beginning next week, pews from the church will be moved to the chapel and affixed to the floor in order to accomodate kneelers for most of the seating. The baptismal font from Holy Rosary has been moved into the chapel. The Stations of the Cross original to the chapel have been hung. Come and pay a visit to the Blessed Sacrament and pray for our world and our parish. Next week we will visit Philadelphia once again to take delivery on some beautiful liturgical items for the new altar. We will be be picking up an impressive cruciform-shaped monstrance and will hopefully learn its history as well. We have also reserved a beautiful set of six matching candlesticks and altar cross. We will place them on display during our weekend masses as soon as they are in our possession. McCrery Architects have completed the design drawings for the renovated church ahead of schedule enabling us to move ahead with the permit process, the construction manager's contract and bidding on the subcontractor components of the project. We thank them for their diligent work and their collaborative style through the design process and their helpful suggestions along the way.